* I find the central limit theorem pretty darn amazing. * For a series of random draws from any well behaved distribution, the mean of that series of samples from that distribution is normally distributed as the size of those samples gets large. * This might seem at first like a lot of mumbo jumbo but this result is easily demonstrable and extremely useful. 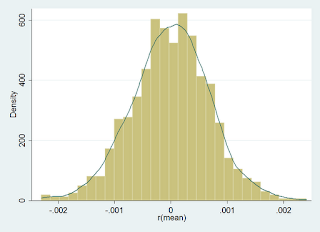 * To show the central limit theorem (CLT) in action we will use Stata's simulate command. simulate mean_x =r(mean), reps(1000): randdraw 1000 "rpoisson(10)-10"
* Looks pretty normal, but that is not so surprising because the poisson distribution begins to look pretty normal once k gets as large as 10. * So how exactly does the central limit relate to all of this and why is it so cool? * The argument is that as N the number of draws going into each mean calculation gets large, the distribution of the means begins to look normal. simulate mean_x =r(mean), reps(1000): randdraw 10 "rbinomial(1,.05)-.05"
* This is the mean of a bernoulli distribution (weighted to .05) either 0 or 1 with each mean representing 10 draws. 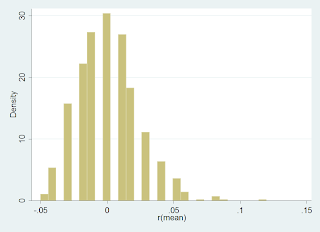 * We can see that this is clearly not normally distributed. However what happens when we increase the draws to 100 rather than 10? 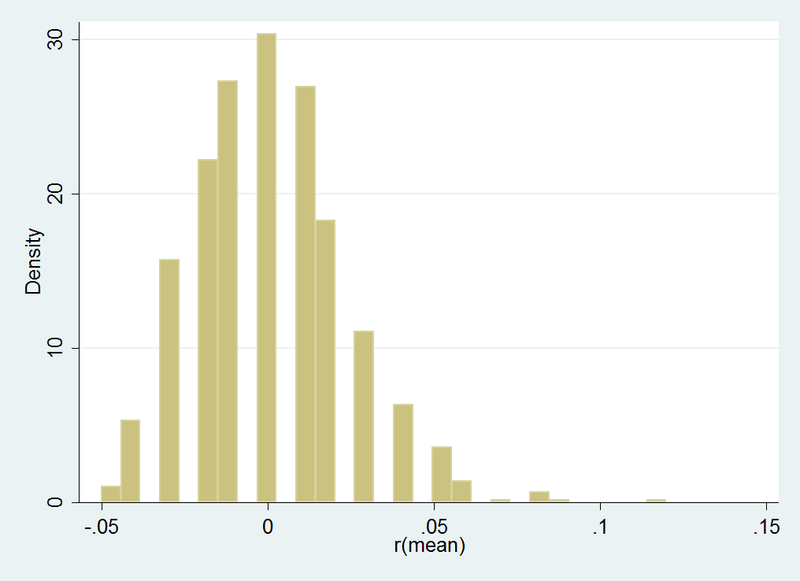 simulate mean_x =r(mean), reps(1000): randdraw 100 "rbinomial(1,.05)-.05"
* Already things are beginning to look a lot more like a normal distribution. Obviously it is not normal because the potential outcomes are discrete. * Perhaps it will look better at 1000 draws. simulate mean_x =r(mean), reps(1000): randdraw 1000 "rbinomial(1,.05)-.05"
* This is what is meant by asymptotically converging on a normal distribution. As N gets large the distribution of the means begins to look more like a normal distribution (so long as the variance of x is finite). * Perhaps it will look better at 10000 draws. simulate mean_x =r(mean), reps(1000): randdraw 10000 "rbinomial(1,.05)-.05"
* Still not looking perfect. simulate mean_x =r(mean), reps(1000): randdraw 100000 "rbinomial(1,.05)-.05"
* Now things are looking very close to normal. Of course there will be some randomness in the 1000 draws which have enough inherent variation to make even a normal variable look non-normal. * This might take a little while but let's increase the draws one more time. simulate mean_x =r(mean), reps(1000): randdraw 1000000 "rbinomial(1,.05)-.05"
* So using a x variable with are bernoulli(.05) leads to a convergence in means that looks normal not until around 100,000 draws. This might sound bad but it really is not. * Because, usually we don't need the individually drawn means TO BE normal just to be approximated by a normal distribution as well as their standardized values as being approximated by a chi-squared distribution for null tests. * In addition, a bernoulli(.05) is an extreme distribution with a large skew and discrete outcomes. Most distributions, even binary and count distributions are going to have properties which are more similar to a normal distribution causing more rapid convergence on normality. * Even a .5 bernoulli begins to look pretty normal at 1000 draws. simulate mean_x =r(mean), reps(1000): randdraw 1000 "rbinomial(1,.5)-.5"
simulate mean_x =r(mean), reps(1000): randdraw 1000 "runiform()-.5"
simulate mean_x =r(mean), reps(1000): randdraw 1000 "rnormal()"